Improve your renter’s experience with easy rent payments. Your rental income gets to you on the dot every month with our flexible payment options for renters. Your residents can set up automatic rent payments by directly connecting their desired bank account to free online ACH payments. If there are multiple residents, each individual can setup their own payment and split the rent accordingly among roommates. Renters will be onboarded with their personal Onerent resident dashboard accessible via our mobile or desktop application. Here they can quickly and conveniently set up one-time or monthly rent payments and track their payment history. We handle rent collection for owners on our Full-Service Management Package, including late fees from delayed rent payments. Rent is due on the first and late on the second, incurring a late payment fee. If residents fail to pay rent within 3 days of due date, we send a 3-day notice to pay or quit. If the resident is covered by our $15,000 eviction coverage, we’ll handle and cover all legal fees associated with an eviction process. We accept payments via cashier’s check or money order in physical mail when necessary. Get your free rent estimate now! Maximize your rental income today. Your rent estimate is completely free! Will Your Home Renovation Make Its Money Back? Built in San Jose, CA USA · © Onerent, Inc. 2018. All rights reserved. 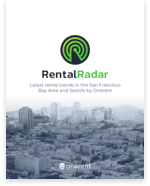 The RentalRadar report has been sent to your email.